Is your marriage going soft? Well you're in luck, because President Barack Obama's got some tips for keeping things spicy with your significant other. Barack and his wife Michelle sat for an interview with Barbara Walters recently, when Barbara asked how the couple "keeps the fire going." Barack laughed, then replied, "We've been married now twenty years, and like every marriage you have your ups and you have your downs, but if you work through the tough times the respect and love that you feel deepens." And that's the secret, folks. In this week's address, President Obama and First Lady Michelle Obama wish everyone a Merry Christmas and Happy Holidays, and thank our brave troops and their families for their service. 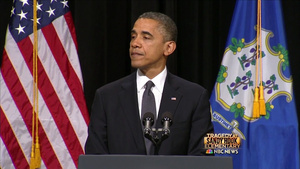 Speaking before an auditorium of grieving parents, community members and others there to mourn the killing of 20 first graders and six educators from Newtown, Conn., President Barack Obama pledged Sunday to use the power of the office he occupies to end the epidemic of gun violence shaking the nation. "We're not doing enough," the president said. "And we will have to change." "We can't tolerate this anymore," he added. "These tragedies must end, and to end them, we must change. We will be told that the causes of such violence are complex, and it is true. No single law, no set of laws can eliminate evil from the world or prevent every senseless act of violence in our society. But that can't be an excuse for inaction. Surely we can do better than this." The speech was the fourth and most direct that the president has given in the wake of a major instance of gun-related violence. His day had started with a trip to see his daughter, Sasha, at her dance rehearsal at the Music Center at Strathmore in North Bethesda, Md. And as he took the stage at Newtown High School, in a quiet New England town tucked in the southwestern corner of Connecticut, it was evident that he still occupied the mindset of a father frightened at vulnerability of young children. "If there's even one step we can take to save one child, or one parent, or one town from the grief that has visited Tucson, and Aurora and Oak Creek and Newtown and communities from Columbine to Blacksburg before that, then surely we have an obligation to try," the president told the auditorium. "In the coming weeks, I'll use whatever power this office holds to engage my fellow citizens, from law enforcement to mental health professionals to parents and educators in an effort to prevent more tragedies like this," he said. "Because what choice do we have?" These moments have become disturbingly regular for this president. His speech in the aftermath of the Fort Hood shootings touched on the concept of justice for such heinous acts. His address to the victims of the Tucson, Ariz., shooting that nearly took former Rep. Gabrielle Gifford's (D-Ariz.) life focused on the need to renew the human spirit in the wake of seeming madness. His talk before the National Urban League convention following the shooting in Aurora, Colo., rested on the notion of community and how society can protect and better itself even amid epidemics of gun violence. First Lady Michelle Obama talks with children of military families in the Green Room of the White House during the Christmas holiday press preview, Nov. 28, 2012. First Lady Michelle Obama decided to theme this year's White House Christmas decorations "Joy to All". Here she takes some kids from military families through the White House to see the decorations. President Barack Obama is seen on his arrival to Esenboga Airport in Ankara, Turkey, April 6 2009.